There are a lot of reasons to go to Greece. Whether you love the historic architecture or the mythical gods and goddesses, this country is full of energy and echoes of ancient days and traditions. Although Greece isn’t on the top of most ghost hunters hit lists, there are some active locations around Greece that you should definitely check out while you are there. Start at Daveli's Cave in Penteli Athens. Locals believe that this is a paranormal center filled with ghostly apparitions and even UFO visitations. Said to be where the ancient temple of Pan was located, this place is said to be full of unexplainable noises and creepy feelings. A big cemetery fan myself, you know I would tell you to visit Maroussi Cemetery in Athens. Those who live around the area say they have seen an apparition of a young girl referred to as Anna near the cemetery gates. Looking for the Lord of the Underworld? Check out the Necromanteion near Perga in the Amvrakian wetlands. Legend has it that this is where the Lord of the Underworld abducted the goddess Persephone so this spot is full of weird energy and a sense of the mystical. Vampires are all the rage...so to speak…right now, so be sure to make a stop at Santorini Island. You'll have to board a boat to get there, but this is a Mecca for Vampire and Goth fans. Santorini Island is said to be the resting place for hundreds of people who were thought to be Vampires and modern age bloodsucker-wanna be's still head out there for events during the summer. A weird vibe is prevalent here, so be sure to bring your garlic necklace! Overall, if you want to find some active spots, talk to the locals. There is nothing better than hearing a ghost story passed down from generation to generation or to see the excitement on someone's face who has had an otherworldly encounter. I have to agree. Its a love photo. 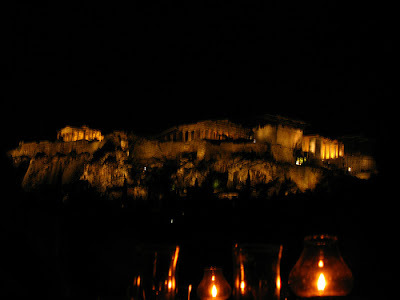 I haven't been to Greece yet and I'm sure I'm gonna love it there more than the ghost stories it has.